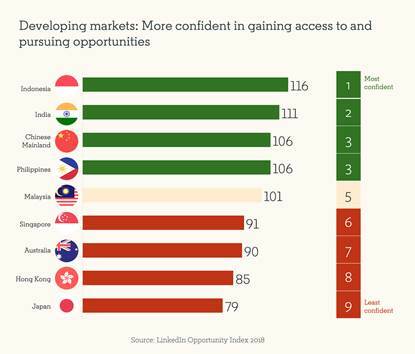 When it comes to achieving career advancement, India is the highest scorer in confidence among all APAC nations, shows LinkedIn’s recent survey. The inaugural edition of the LinkedIn Opportunity Index in Asia Pacific (APAC) region was launched today. The index has two broad focal points – firstly, to understand the perception of opportunity across countries and secondly, to analyze the obstacles that hinder the efforts to achieve and make the most of these opportunities. The survey had more than 11,000 respondents spread across nine markets in the APAC region - Australia, Mainland China, Hong Kong, India, Indonesia, Japan, Malaysia, the Philippines, and Singapore. The index is an analysis of the aspirations that motivate employees across nations, a measurement of their confidence in their country’s economic potential and also a tool to understand the workings of social mobility across the region. 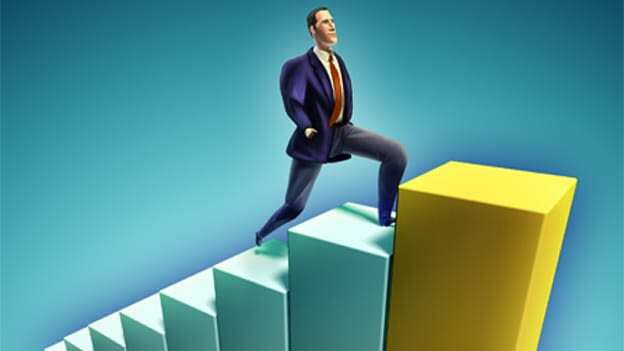 Indonesia and India occupy the top rungs of the ladder while the more experienced markets of Japan, Hong Kong and Australia lag behind. This could be because participants from the latter group of developed nations were more cautious when it came to grabbing opportunities and are also probably not as aspirational as people in emerging markets. Olivier Legrand, Managing Director, Asia Pacific, LinkedIn spoke of the required universality of opportunity and the index was a tool to understand desired opportunity and roadblocks. Akin to the sample from most parts of the region, Indians regard career advancement as the primary opportunity and objective at work. Moreover, India scored 77 per cent and stood most confident among the nine countries when it came to believing in being able to achieve career growth. This points toward more than the fact that Indian believe they have what it takes to advance their career goals. It speaks of a nation that is optimistic about its skills and standing in the world of work. With regard to entrepreneurship, India scores on top of the leaderboard as well (13%) along with other growing economies like Indonesia (34%) and Philippines (29%). The Indian Government’s stance on entrepreneurial spirit with startup schemes and campaigns has also fueled the growth of the self-starter Indian who is willing to embark on a business venture from scratch. For aspirational and hopeful Indians, hard work (95%), the spirit of learning and an environment that is conducive to the same (14%) along with the power of the right connections in the right places (89%) is the formula for growth and success. Being an inherently collectivistic nation, albeit communal, prioritizing these facets makes sense. While the quality of education is a prime concern, more than 35 per cent of Indians want to be able to apply their skills and knowledge sets. A 90 per cent majority feels that social media and digital source help them to acquire new skills and information to secure new jobs. 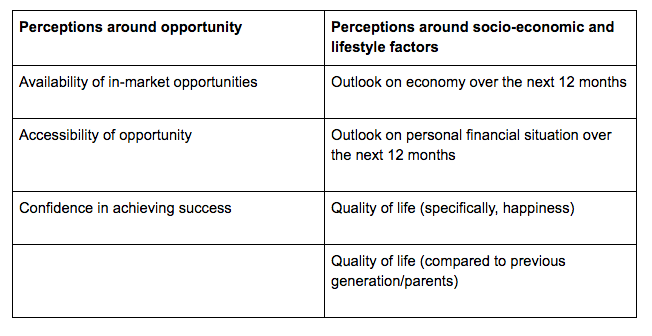 In terms of barriers that prevent the utilization of perceived opportunities, the list includes financial status (31%), lack of direction and guidance (20%), and a difficult jobs market (19%). With a new India taking form with its roots in digitally driven, globally relevant and technologically comfortable people, processes and products, understanding what really drives the machinery forward is not only interesting but also a requisite. Knowing what drives people and what hinders their path ahead will enable businesses to plan and deliver execution with greater intelligence.